Learn to effectively interpret virtually every ECG you're likely to encounter in clinical practice - in ten brief lessonsThe only review book to offer full-sized ECGs throughout (simulating how they appear on tests and in actual practice), this sourcebook is the most sought-after ECG review anywhere, trusted by cardiology fellows, internal medicine residents, and medical students alike. 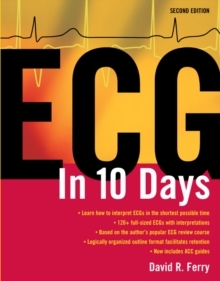 ECG in Ten Days is based on the author's popular ten-day review course, and features a unique step-by-step approach, crystal-clear vector images, plus practice EDB strips to build confidence and fine-tune clinical skills. In these pages, you'll find essential information on everything from SA & AV nodal conduction abnormalities, to mechanisms of arrhythmias and electronic pacemakers.